Hard to believe it’s been over a week since I posted. I’ve actually lost track of what day it is at times (which has been fun) and I ended up taking a break from technology which was wonderful. I’ve kept up with blogs on my phone, but I mostly have not been commenting. By the sound and look it appears that everyone had a fine holiday. Our Christmas was nice…busy, but nice. The weekend before Christmas we ended up at a concert by Piffaro which was fabulous. Piffaro is a Renaissance group based in Philadelphia. They only play period instruments from the 1500’s and their music is also from that time. The entire program was in French (the concert was “A French Noel”). 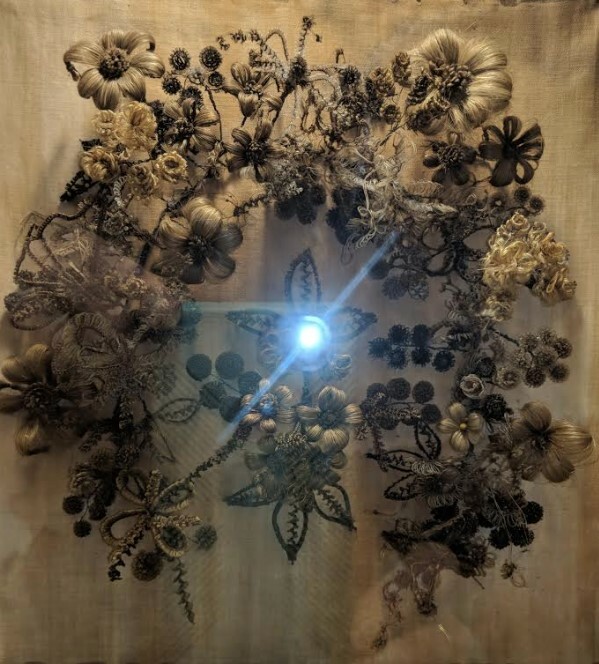 Their music can be found on Spotify if anyone is interested in hearing them. We also went to the movies and saw “The Favourite” which we really enjoyed. It reminded us all of “Phantom Thread” – not the story line, but the atmosphere of the movie. Last Thursday we watched “Florence Foster Jenkins” with Meryl Streep. I have not laughed that hard or that long in a very long time. Meryl Streep is such a fine actress. Hugh Grant was very good in this as well. Colin cooked dinner on Christmas day - a wild boar ragu which was amazing! It tasted more like beef than pork to me and was very tender. He served that over home-made pasta and we had a bunch of roasted vegetables to go with. Dessert was a pear crisp. Yum!! The day was long but relaxed. Fletch, Zhongren (Mailing's Dad) and I all fell asleep in the afternoon! We played Mahjong, worked on a jigsaw puzzle, read, etc. This past Friday was damp, grey, wet, foggy, etc., etc., but I braved the elements and drove up to Emmaus to meet up with Dee. The drive up (mostly by the Perkiomen Creek) was gorgeous – kind of like a Sleepy Hollow area – the water was all misty and foggy. The yarn shop in Emmaus doesn’t open till noon, so we went out for brunch and then to the coffee shop (delicious Turmeric Golden Milk Lattes) for some knitting and chatting and then to Conversational Threads. What a great store! I managed to get a few skeins of yarn (all solids). As always, it was a fun day getting together with Dee. I have not been doing a lot of knitting, but I managed last night to finish the first Artic Fox sock for Colin. 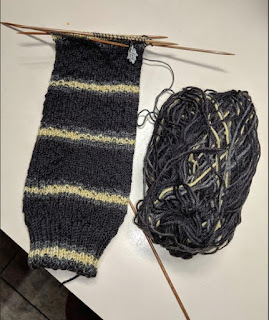 I realized (again) that I would not have enough yarn for two socks. Both Fletch and Colin like the leg of their socks to be a bit longer and they both have long feet. Thus, I used one of the solid skeins I picked up on Friday to finish up the foot and toe decreases of sock #1. 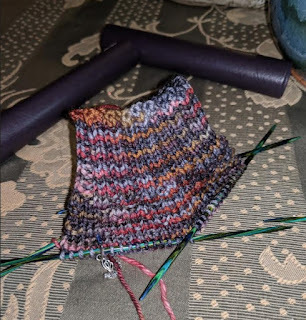 Sock #2 has been started and the cuff ribbing is done. I hope to get more done on that today before we go out later. I think I mentioned that Colin heads of up volunteer arm at his company for the Pennsylvania Philharmonic. They are giving a concert this afternoon at a local community college, so we are going to head out to see that. I believe the program is Broadway tunes. Should be a fun couple of hours. 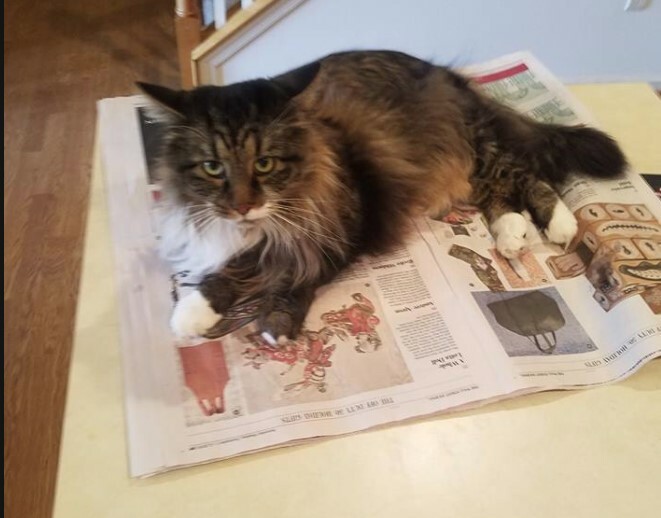 On the reading front, again, I have not done much. I read the latest Louise Penny (Kingdom of the Blind) and really enjoyed it. I’m in the midst (about a third of the way through) “The Feather Thief” and am enjoying that. That about wraps it up for me. Wishing everyone a very Happy New Year! May we all be blessed with excellent health, much happiness and a whole lot of joy! Hello There! Happy Solstice! Merry Christmas! It has been a busy morning, but now it is shortly after 11 a.m. and things are winding down at work. 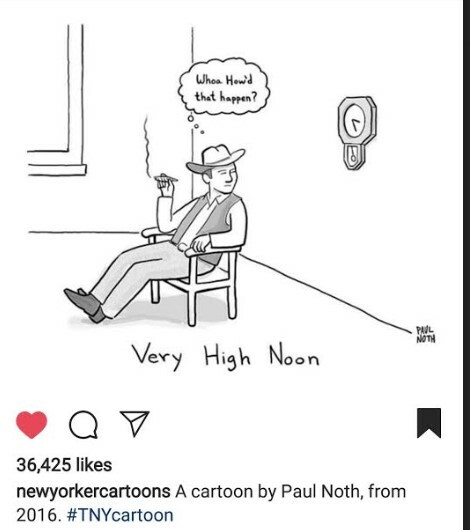 I hope to get out of here by Noon. I'd like a nap and then a shower and then Colin will be over for dinner tonight (Mailing is doing something with her co-workers). My oven is still not fixed - it should be either today or tomorrow. Luckily I had things in the freezer that I could make on the stove or warm up in the microwave. Last night we did order from the local pizza place and tonight will be take out from a Chinese place. Shopping is mostly done. I have a few remaining stocking stuffers to pick up and a few things to wrap. It seems like a nice pace this year - not frantic down to the wire. The weekend looks like fun. Tomorrow morning I'm meeting Dee for coffee and knitting and chatting (I wonder if there will be a parade???). Then we are heading over to Northbound for lunch - a place that Colin and Mailing recommended. And tomorrow night we are going out to dinner to celebrate Anna's birthday (Mailing's sister). A full day, but all fun things! Knitting on the Arctic Fox socks continues as does reading Kingdom of the Blind which is certainly not disappointing. I expect to finish that (maybe tonight??) and start in on The Feather Thief next. Wishing you all a most relaxing and joyful Holiday Season. Welcome to mid-week. It is a cold one here (9:20 a.m. and still just 28 degrees). But Colin texted me that it could get up to 60 by Friday (of course...rain and flood watches are in the forecast as well). After knitting that terribly fiddly cat, I decided I needed some easy knitting and have started a pair of socks for Colin. Once again the pattern is Hermoine's Everyday Socks - a free pattern on Ravelry and one that gives very nice texture to socks. 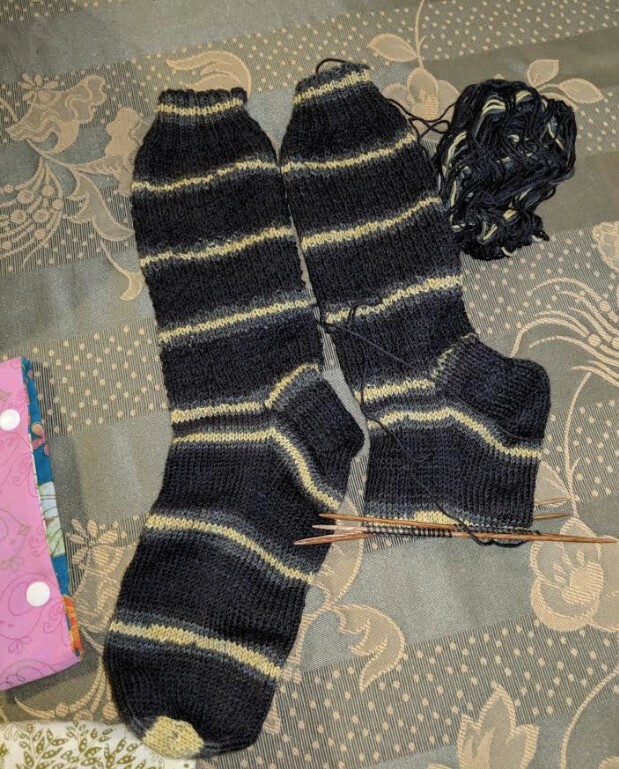 In reality the socks are a bit darker, but I love all the various shades in the yarn. The yarn is an 80/20 blend from Mineville and the colorway is Arctic Circle. This shot was taken early last night...since then I've added another 12 rows or so and hopefully more will be added at lunch today. My day started with an 8 a.m. doctor's appointment (regular 6 month check-up) and all is good. I had blood drawn last week (too many tubes!!) - and all my numbers are good! YAY! This is my last full day of work this week. Tomorrow I'm leaving by 12:30 to meet the Lame Duck for drinks. He and his wife are up from FL for the holidays and he wanted to get together. He put a very nice book together for everyone in the division using Shutterfly - pictures from all the years we worked together. A reminder of good times (the last few years were rough - especially for him...but now he is retired and all is good). Friday we are closing at 1:00 and are closed next Monday-Tuesday-Wednesday...and I doubt I will work Thursday or Friday. So a nice bit of time off. On the reading front I'm a little more than halfway through "Kingdom of the Blind" the latest Gamache book from Louise Penny. So good! I'm making myself read it slowly and not rush through it so it will last - lol. 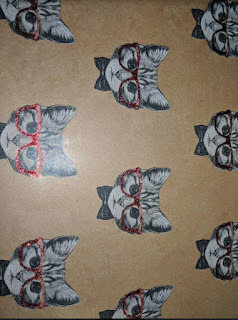 Joining Kat and friends for Unraveled Wednesday. What are you up to? The sun is (finally) out. What a soggy weekend we had - lots of rain and then high winds. So....my weekend did not start out very well. After dinner on Friday night I started baking. I got one batch of cookies done and then my oven quit! It's electric and the heating element fried itself. This happened once before - back in 2010. That first time the fire department arrived! Luckily that did not happen this time, but until we can get someone out to repair it, my baking is on hold. Saturday was nice despite the weather. We went over to Colin & Mailing's for dinner to celebrate Colin's birthday. 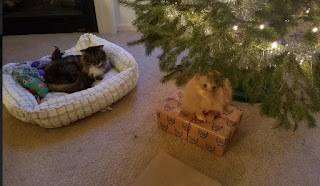 Here are the kitties checking out the gifts. Marcel sat on the one gift for quite some time. Talbot didn't really seem ALL that interested - lol. 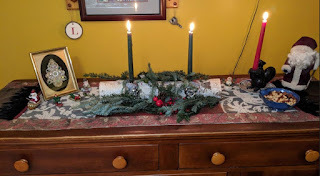 Here is their mantle. The stocking on the right is one that my 2nd Mom (Leslie's Mom) made (needlepoint) for Colin when he was born - so it is 29 years old!! 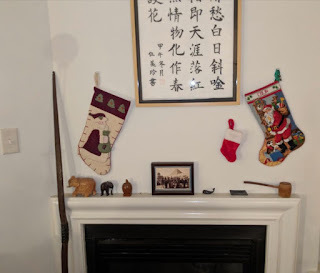 The thing that looks like a stick on the left is a bow that my uncle carved - probably in the 30's or 40's. Dinner was delicious. 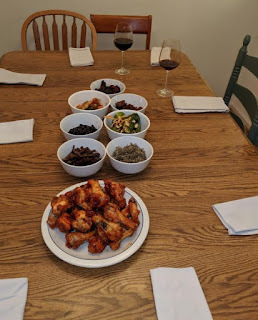 Mailing made Korean fried chicken - two varieties one was hot and the other was a butter-honey. OMG, so good. To go with there were plenty of things I had never had!! Lotus root,, burdock, sesame leaves, and then there were pickled cucumbers, soy beans and anchovies. Dessert was a pistachio cake - Yum!! Here's a shot as stuff was being put on the table. Sunday was pretty much a lazy day. 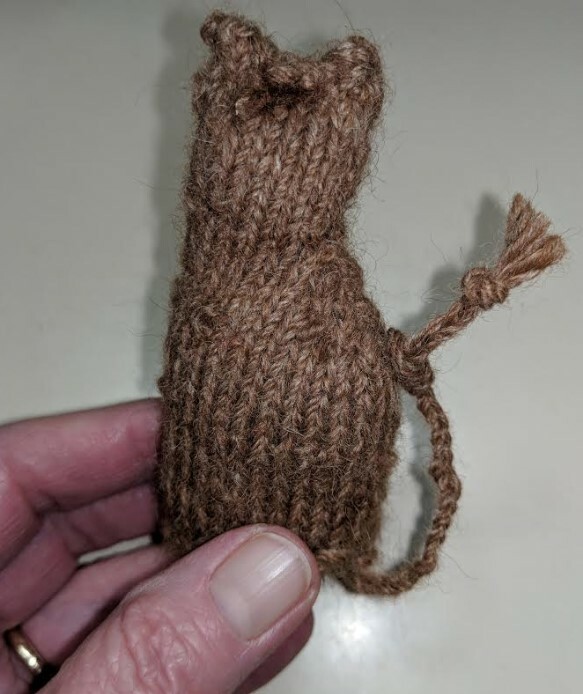 I did an errand or two and then decided to knit a tiny cat. What a fiddly mess that was! I will not be doing this again. I used alpaca yarn which kept splitting and fraying. Anyway, my version ended up looking like a cat that has been in a fight. The tail is supposed to be knit, but I had had enough at that point, so I just braided some yarn and tacked it on. A cute idea, but way too fiddly for moi. 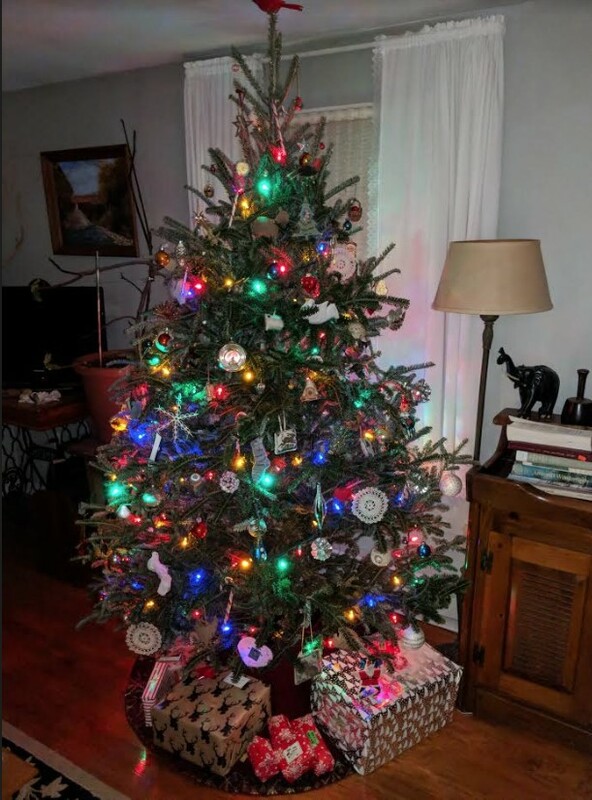 Finally, some of you asked to see our tree. Here is a shot I took this morning as I sat with my coffee enjoying the lights. I cut off the top by accident, but we always put a red cardinal at the top of our tree. Hoping this week will be easy. Today is probably busy, but the rest of the week should be a breeze (fingers crossed). Hope your week goes well. Finally TGIF!! All week I've been a day off and, in fact, when I was leaving the office yesterday I was telling everyone to have a nice weekend. Someone asked "are you off tomorrow?" Which, of course, stopped me in my tracks. All day I had thought it was Friday - even though I KNEW it was Thursday. So, now it is Friday, truly. Colin was over last night and we trimmed the tree before dinner. It looks so nice and this morning I sat in the living room with my coffee and just the tree lights on - bliss. Last night Fletch grilled the most delicious lamb chops we have ever had. They were some I bought from a farmer when Dee and I went to the Mennonite Heritage Christmas Market. I never want to buy lamb from a grocery store again! More butter is softening on the counter today - the plan is to make chocolate chip cookies and macaroons tonight. We will take a bunch of the cookies over to Colin & Mailing's tomorrow night. For your Friday morning laugh - Colin showed me this last night and I cracked up. Too silly. Wishing you all la fabulous weekend! This year's design is simple, but so pretty. 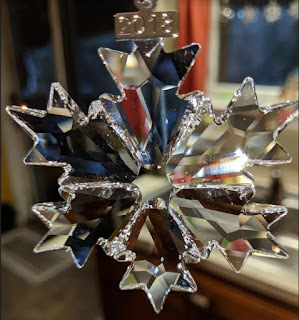 We have the ornaments hanging in our kitchen windows where they catch the sun. Last night I made two kinds of cookies. I forget the name of the first one, but they are small, round cookies flavored with ginger, cinnamon, nutmeg and cloves. Love them! The 2nd kind was a disaster - lol. Before dinner I mixed up dough for some ginger shortbread cookies. First I read the recipe incorrectly (I can't see small print) and thought it said 1/2 Cup of butter when in reality it said 1/2 pound of butter. A rather large difference. But, I caught that before I finished mixing the dough. I rolled it into logs as the directions called for, wrapped in plastic wrap and put them in the fridge for several hours. Took them out, sliced and baked. They melted into a mess and they tasted horrible. The whole batch (with 1/2 Cup of butter) went into the trash can. The recipe (new to me) is also in the trash! The birch log that Fletch drilled holes in for candles, a little greenery, my squirrel candle holder (love him - got him years ago at Restoration Hardware) and my most favorite - the framed tree that Fletcher's Mom made out of costume jewelry. So sparkly and pretty! Not a great picture, but the best I could do last night. I also write Christmas cards last night! I know - amazing!! The plan had been to finish wrapping gifts to ship, but since I was holed up in the kitchen baking, I decided to sit at the table and write some cards. The tree is in the house - Fletch will put lights on it today and we will decorate it tonight when Colin comes over for dinner. We are almost ready for Christmas!! Well, I'd best get back to work. It's Thursday and I have a bunch of financial reports to run. Hope everyone's week is going well. It's almost Friday!! It is another sunny day here and a bit warmer (30 versus 20). I did see a chance of snow for tomorrow, but I think that will be a bit more north of us. 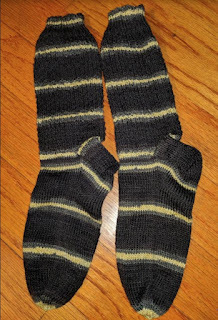 Last night I managed to finish up the striped socks for Fletch. I love that I did NOT run out of yarn and I love the way they turned out. 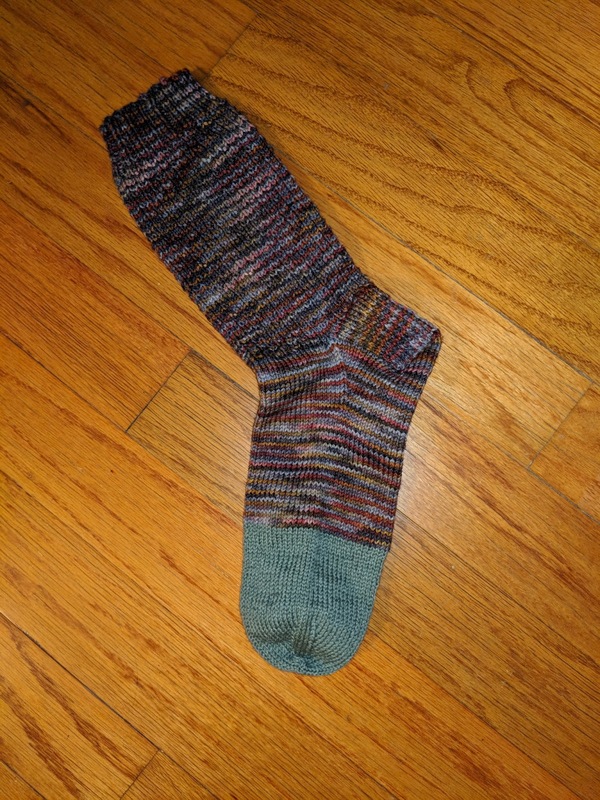 The 2nd sock has a tiny spot of grey at the end of the toe which the first one doesn't, but to my eye they match pretty well. I think he will like them. As of this moment I have nothing on the needles! What??? I'm debating what to cast on. Do I try the cowl again (with no thought of rushing to get it done for Christmas)? 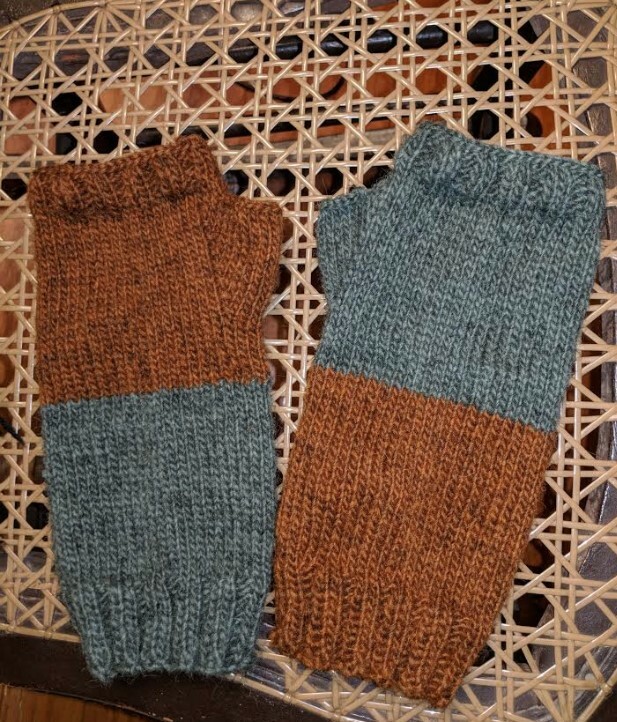 A pair of socks for Colin (again, not for Christmas)? Fletch wants a bulky cowl, but we need to pick out some yarn. Colin also wants a knitted blanket and I'm thinking this has to be bulky to make it go fast - lol. I've also been perusing the latest issue of Amirisu Issue 17 which arrived last week. Oh my - so many beautiful patterns. I love Kukka (Margaret - Days of a Sampler Lover) recently knit it up and it is gorgeous. If you are not familiar with Margaret, you should check out her blog or her Instagram account. 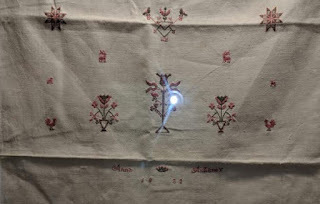 She is amazingly talented (not only knitting but cross stitch and quilting as well). And, if you are not familiar with Amirisu - check it out. A gorgeous magazine along the lines of Laine and when you order it you also receive a code to download the patterns in your Ravelry library (like the MDK Field Guides). Progress was also made in other areas. Last night I wrapped and boxed up gifts for 3 groups of people we mail to and those boxes are in my mail room at work ready for the UPS guy to pick them up. We still have 3-4 more groups of folks we ship to, and I hope to get those done tonight. While I am at work today, I have a pound of unsalted butter coming to room temperature on my counter - hoping to bake some cookies tonight as well. Finally, Fletch went out yesterday and got a tree. He will get it in and lights on it today/tonight and when Colin comes over tomorrow we will decorate it. I love sitting in the living room in the early morning with my coffee and just the tree lights on. Looking forward to that quiet time. Today is our Christmas lunch for work. We are having it at Davio's in King of Prussia - a really nice Italian steakhouse. And...we get to go home after lunch. My kind of day - lol. Joining in with Kat and friends for Unraveled Wednesday. Thankfully no unraveling has been needed. Hoping this Hump Day finds you enjoying life. Monday seems to have come around awfully quickly (as always). For those of you in the Southeast with the major snow storm I hope you are all ok and warm and safe. I talked with my friend who lives outside of Greensboro, NC and at 3 p.m. yesterday they had a foot of snow! It was still coming down while we talked and then it changed to freezing rain - not a good thing. My parent company's office in Charlotte is closed today. Meanwhile in PA we have no snow, but it sure is cold! The weekend turned out well. I got a little cleaning and a tiny amount of decorating done Friday night. I was up early Saturday cooking and then had to run out to the store. I had no fresh veggies for our meal! (and needed wine...). I made an easy chicken casserole with mushrooms and we had some cinnamon carrots and French green beans to go with that. My SIL brought a loaf of home-made 12 grain bread (yummy). Dessert was a pear & cranberry cobbler with whipped cream. Colin and Mailing joined us as well. It was fun and nice to see my brother and SIL again, but I had to lay down after they left - my head was pounding. My brother is extremely loud and gets even louder the more worked up he becomes on any given issue (and the more he has to drink). Luckily no political discussions came up. I'm just not used to the noise level. But, still, it was a nice time and I'm glad they came. That night I was still too full from the afternoon meal for any dinner. But I did accomplish some knitting! Not finished yet, but close (still playing yarn chicken here - I think/hope I will win). I'm pleased with how I've managed to match these. I unraveled some yarn from the skein before starting sock #2 so that I would begin in the same place yarn-colour-wise. And it worked! These came with me to work today and I'm hoping to knit some at lunch. Yesterday was full of chores. We went grocery shopping. I paid bills and updated spreadsheets where I track what we spend (basically so I see how much $$$ we waste). I made a HUGE pot of spaghetti sauce for dinner using some Italian sausage (hot and sweet) that Fletch had grilled the other week. Lots of peppers, mushrooms and onions too. Now we have a bunch of sauce in the freezer. And last night I finally started making cookies. To start with I made oatmeal raisin. Probably my least favorite cookie, but Fletcher's favorite so I think I deserve some points for that. And I wrapped Colin's birthday gifts (his birthday is tomorrow and we are celebrating next Saturday at his and Mailing's place). 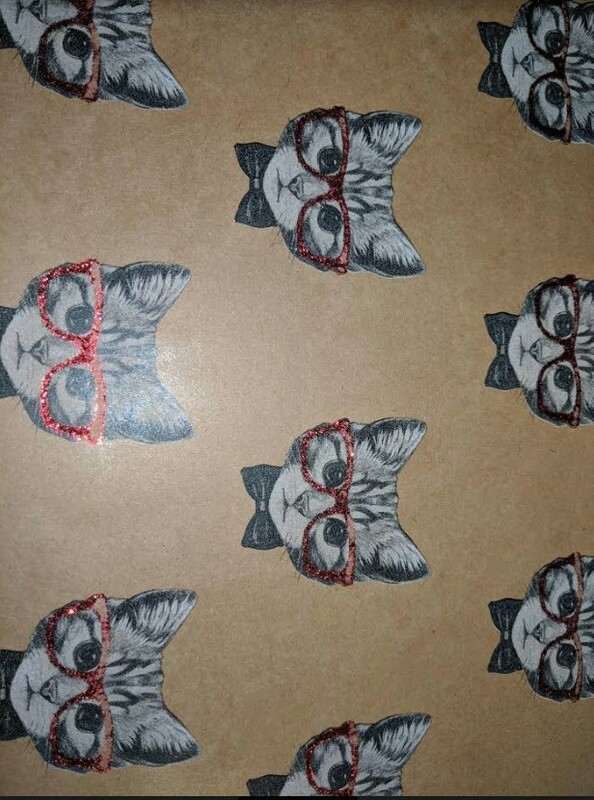 Look at this great wrapping paper I found. I love it! Sorry - I can't manage to turn it around. It's amazing what I can get done when I don't take a nap - lol. And, as always happens, I had 4 books come through on Overdrive in the last couple of days! The latest by Louise Penny ("Kingdom of the Blind") - Inspector Gamache. Can't wait! And "The Feather Thief" which I've been waiting for it feels like a year! "Overstory" came in - I will probably let that one go and put myself back on the wait list, and one other I will let go (can't remember the title right now). I hope you all had wonderful weekends and that the week ahead finds you smiling! A very busy Friday!! Not my usual style, but there you have it. Nothing was accomplished last night...but that's ok, because Colin was over for dinner and that trumps chores any day of the week. Fletch is doing some cleaning today (Yay!!) and I will tackle bathrooms tonight. And the kitchen....I need to start cooking early tomorrow morning as we are planning a mid-day meal for my brother and SIL (and Colin & Mailing). My hope/plan is that by tomorrow night I am taking it easy and knitting. Time will tell. Meanwhile, for your enjoyment, here is a shot of Talbot reading the Wall Street Journal. LOL If I'm not mistaken that was the WSJ's gift guide - perhaps he was perusing for gifts for Colin & Mailing? Tyg has been in some very cute/playful poses lately, but every time I try to get a picture of him he moves and turns his back to me. The weekend is pretty full. Believe Fletch plans to go out and get a tree for us early next week and we will decorate on Thursday when Colin comes over for dinner again. Wishing you all the best of weekends - enjoy!! Here we are on an unraveled Wednesday...3 weeks before Christmas...no decorating has been done at my house (well, Fletch did put up the pine cone wreath that his Mom made for us a long, long time ago...he tried 3-4 different strands of lights for our patio and all of them only half lit - I think he is going out today to buy more lights). I have not written a single card and I have not wrapped any gifts. Also, I have not baked a single cookie. And, I'm not sure when any of that will happen...but there is time and for once in my life I don't feel anxious or pressured. YAY!!! Tonight we are meeting friends for dinner and I'm looking forward to that a lot. So between Thursday and Saturday morning I need to do some cleaning and food prep - my brother and sister-in-law are coming up on Saturday for the day to celebrate the holidays (at least their gifts are bought...just not wrapped - ha!). Colin & Mailing will be coming over too. I'm not taking either Thursday or Friday off, so my nights will be a little busy. This morning over coffee I started the heel flap. I'm thinking/hoping I'll be ok with yarn. 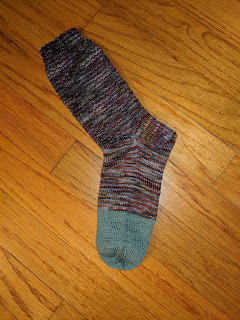 I made the 1st sock pretty long (88 rows for the leg). I kept weighing the yarn and had not used half of it for the first sock. BUT this is Lang Jawoll yarn and I had not realized that tucked in the center of the skein is a bundle of reinforcing yarn (which I didn't use on the first toes because I didn't know it was there!!). If I run out towards the end, I'll just use black yarn...after all, the socks will be in shoes. Wish me luck!! I finished reading "The Alice Network" by Kate Quinn the other night and I really enjoyed it. I may have liked it even more than "The Nightingale." "Overstory came in on Overdrive and I hope to start that in a few days - there have been so many mixed reviews, I'm curious about it. Meanwhile, I wanted something very light (a la "chick-lit") to read and picked "The Hideaway" by Lauren Denton. Enjoyable and very fast reading - I managed to get through a third of it last night! That's it for me on this mid-week day. Clouds are moving in and there is a chance of some "wintry mix" of precipitation later - but I think that is mostly for South & East of Philadelphia (we are North & West). Hope everyone's week is going well. Another Finish and Another Parade! Hoping you had a wonderful weekend. Mine started off with a finish Friday night!! 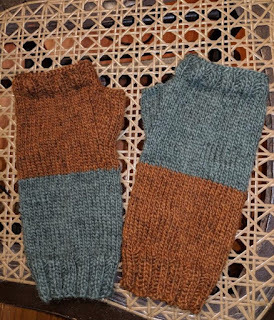 My little brother's mitts are finished. I love the way they turned out. I'm also happy to be finished (for the time being) knitting with Lopi yarn. I had no problems with it when making my Sigla sweater, but knitting the mitts was very hard on my hands/fingers. The yarn was also very, very splitty. So, Saturday Dee and I met up in Franconia at the Mennonite Heritage Center for their annual Christmas Market. The barn (where we first went) was filled with produce of various kinds. I ended up getting some scallions, kale, salad turnips and beautiful loin lamb chops. The main building had a room set up with items for sale: Moravian (I think) stars, beautiful wooden bowls, some woven items. I managed to find a little stocking stuffer for Mailing. The Center is very nice. There are a number of rooms - there was an art show in one and historical items and info in another. Hanging high on the walls are gorgeous woven coverlets. 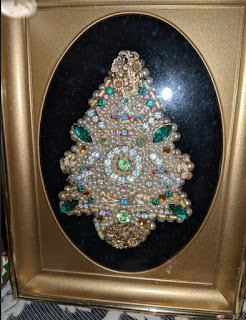 One wall had a sampler and a wreath. 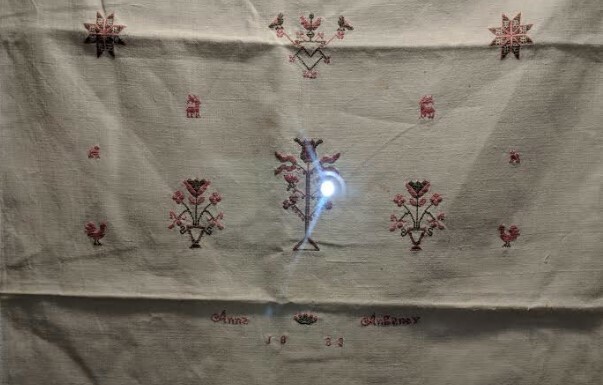 My pictures are not great due to the glare, but this sampler/linen towel was stitched in silk in 1833! That's a lot of hair!! It did not take long to look at everything and then Dee and I were ready to head out for some coffee. We went to Broad Street Grind in Souderton. It took a little longer than expected to get there...we had to detour around a closed road because: yup - another Christmas parade. If you have not already, check out Dee's blog - she got some great pictures of the John Deere tractors in the parade as well as many fire engines. Once again, our seats afforded us great views as the parade went right by the coffee shop. We ended up having lunch there as well which was delicious! I headed home mid-afternoon...had a short time at home and then Fletch and I took off for Colin & Mailing's for dinner. Colin cooked a delicious birthday dinner for Mailing: brisket and veggies and a carrot cake for dessert. Everything was tasty and we had a great time. Now it's another work week. Hopefully it won't drag out too much!